When I saw the current CASology Cue, I immediately thought of this image from an MFT set from years ago called Friends Furever. I had colored it with Copics and never used it. It has been in my snippet box waiting for the perfect moment! This was it. Stephanie, this is adorable!!!! I love that big ol' pooch and his little buddy. 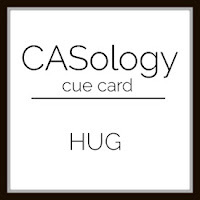 :) Thanks of playing along with CASology this week! This is so very perfect. Love those stamps and how you colored them. I am so missing my pup today and wish I could give him a hug right now. We got back from vacation last night, and doggie is not returning from his 'spa' until tomorrow. Thanks so much for playing along at CASology this week. Definitely the perfect moment! Love this. It's completely adorable. Thanks for joining us at Little Red Wagon. Congrats on the HM at CASology, Stephanie. This is such a darling, heart-tugging card. Oh my gosh, this is such a cute card, Stephanie...I love it! This is super, Stephanie! I love it.